The Mushroom Hunters: On the Trail of Secrets, Eccentrics, and the American Dream by Langdon Cook is window into the strange but exciting world of foragers of mushrooms, morels and truffles. I was excited to receive this book as I had been asked in the past for permission to search for mushrooms and American ginseng on our land in the past. We only had three acres but on one side the ground sloped downwards. The land used to be a state forest so we had a lot of different kinds of trees of different ages. There were many treasures that you could find on a hike down to the stream before. Because of that experience I was thrilled to see this book in my mailbox. It is a great book with loads of information for the recreational seeker of mushrooms and even for professional buyers starting out. One lesson that I had right away that it is almost impossible to eke out a living from selling mushrooms to restaurants. You might be lucky someday and find a big patch that would yield many buckets but there are too many variables to count on it. Beside the thrill of finding sought after mushrooms and morels, the best job benefit seems that you are outside most of the time. There was only one thing that wanted from this book and didn’t get. That was big color pictures of the mushrooms, morels and truffles. This would be necessary for a collector but it for a novice like me. I remember seeing so many different kinds of mushrooms growing down the slope that I have often wondered what kinds they were. I had always been afraid of picking poisonous ones. 1.Where is the mushroom capital of the United States? 2.Why are mushroom hunters so secretive? 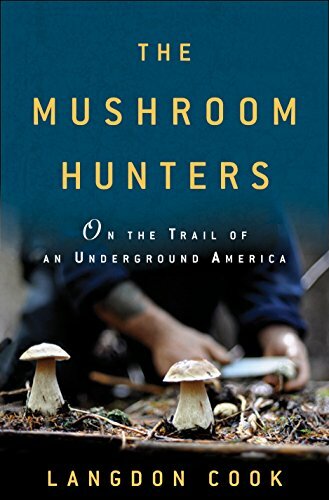 I recommend this book to anyone who is interested in mushrooms and mushroom hunting. Cook travels across America and Canada with the people who make their living in the mushroom business. He teams with the freelance pickers who follow the growth patterns of a variety of mushrooms, mostly along the Pacific Northwest Coast, destined for your farmer's market or high-end restaurant. He shadows the mushroom buyers, the middle men who have the restaurant accounts, and he meets the chefs who rely on foraged produce for their menus. He also looks at the growing Oregon truffle industry and meets the people who are attempting to build a trade to rival the French market. Who knew these folks even existed? Lots of fun but beware - you'll probably never be able to buy those white mushrooms from the grocery story again.